Protein Blend (Whey Protein Concentrate, Milk Protein Isolate, Micellar Casein, Emulsifier: Soy Lecithin), Humectant (Glycerol), Dark Chocolate Couverture (14%) (Cocoa Mass, Sugar, Cocoa Butter, Emulsifier: Soy Lecithin; Flavouring), Hydrolysed Collagen, Fructooligosaccharides, Sunflower Oil, Fat-Reduced Cocoa Powder, Glucose Syrup, Di-Potassium Phosphate, MILK Mineral Complex, Flavourings, Sodium Chloride, Vitamin & Mineral Blend (Sodium-L-Ascorbate, Ferric Pyrophosphate, DL-Alpha-Tocopheryl Acetate, Nicotinamide, Zinc Oxide, Retinyl Acetate, Calcium D-Pantothenate, Sodium Fluoride, Manganese Sulphate, Cyanocobalamin, D-Biotin, Chromium Chloride, Potassium Iodide, Cholecalciferol, Folic Acid, Sodium Selenite, Copper Citrate, Pyridoxine Hydrochloride, Thiamin Hydrochloride, Phytomenadione, Riboflavin, Sodium Molybdate), Magnesium Oxide, Colour (E150c), Sweetener (Sucralose), Antioxidant (Natural Mixed Tocopherols). 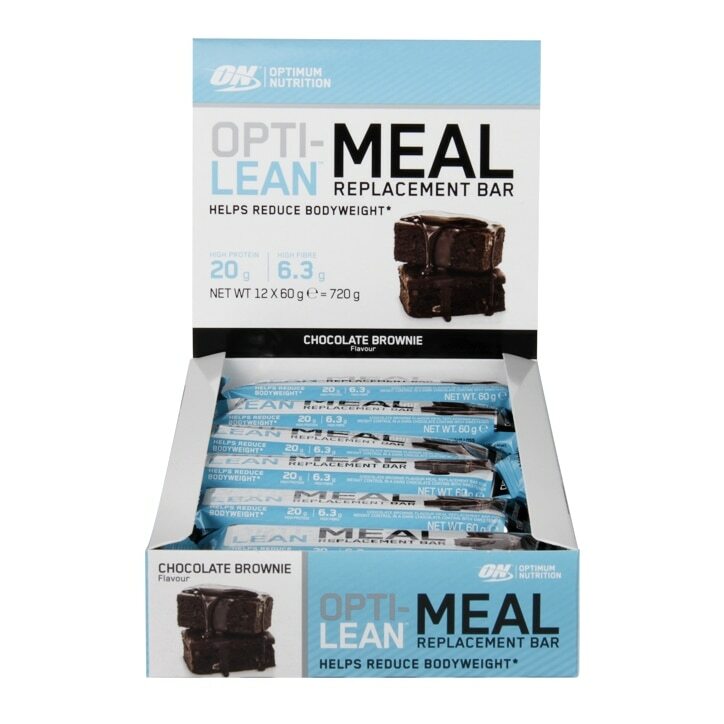 Optimum Nutrition Opti-Lean Meal Replacement Bar Chocolate Brownie is rated 4.1 out of 5 by 16. Rated 3 out of 5 by Maja123 from Wrecking havoc on my stomach. I've been using the Optimum Nutrition Opti-lean meal replacement powder for about 6 months. I decided to try their bars because I'm lazy in the winter. Any one else feeling bloated/upset stomach with these bars? Not sure what is causing it and would love to try an alternative. Thanks!